PLEASE NOTE: Due to ongoing campus construction during the Winter 2019 and Spring 2019 semesters, our parking spot has been temporarily relocated. 1. Exit at Route 1, College Park. 2. 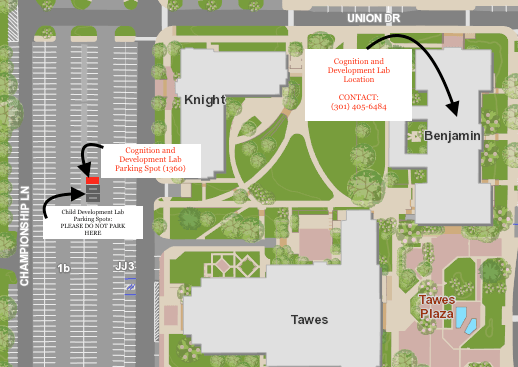 Drive approximately 1 mile south on Route 1 and exit to the right at University Blvd (193 West). 3. After the second light, move into the left lane. 4. Turn left at the third light (Adelphi Rd.) and remain in left turn lane. 5. At the next light, turn left onto Campus Drive. 6. Drive straight and enter the traffic circle. 7. 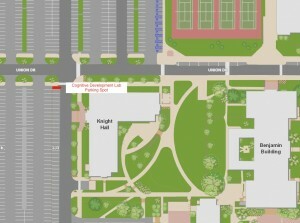 Take the 3rd exit off the circle onto Alumni Drive. 9. Someone will be down to meet you. The UMD parking police ticket very aggressively, and because of this it is important that you please wait by your car. 1. Take University Blvd (193 East) toward College Park. 2. As you approach Adelphi Rd, the road forks. Take the fork on the right for Campus Drive. 3. Cross the Adelphi Rd. intersection and you will find yourself on Campus Drive. 4. Follow steps 6-9 above to find the parking spot.